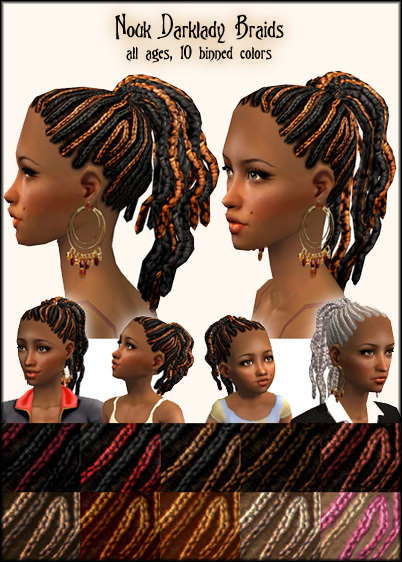 Mod The Sims - Nouk Dark lady Braids - Braids hairdo for ladies of all ages! Hi guys! Im finally back with that hairstyle I was working on before I had Pets installed. Well, it's finally finished, and my game finally works normally again! (ugh, don't ask... long annoying story). 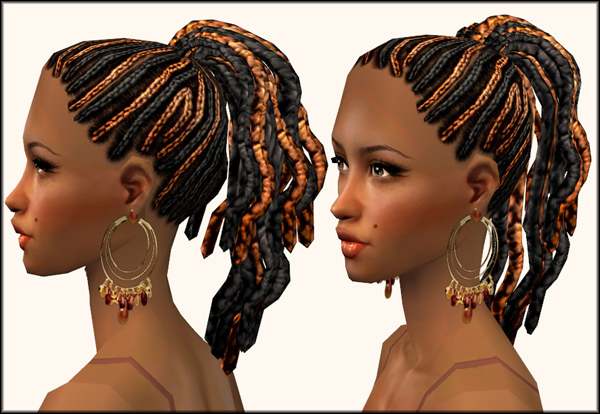 This hair is and ethnic hairstyle, but any girl could wear it! (The blondes look nicer on lighter skintones.) It bounces and moves around, it's bumpmapped, and it's for all ages! Divino (Legacy Echo) for building the packages and testing when my game wasn't working! Ghanima Atreides for testing, recoloring and bearing my whining for her to test for me all the time! Dr_Pixel for being a friendly help and saviour for every mesher out there! Wes_H for being a great help for every mesher and being friendly for every noobie! * Recolor recolor recolor!! I want to see millions of recolors! This style needs many more! Link back to this thread, though! * Only upload anywhere where it's not pay, and credit! 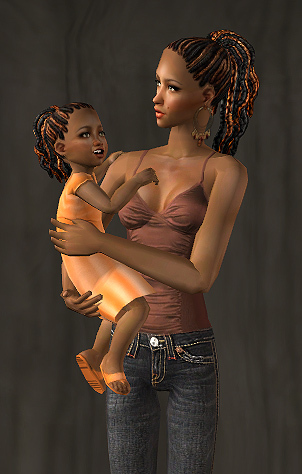 Enjoy, and pay a visit to www.noukiesims2.net as well! Free site! 4637 people have said thanks to Nouk for this download.